The FI70DSW offers an economical solution to display Water Depth and vessel speed, as well as wind speed and direction. 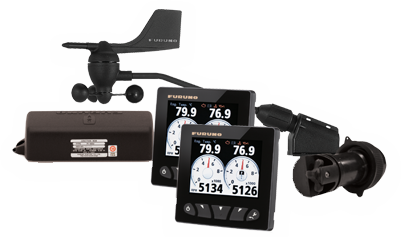 The FI70DSW package consists of the FI5001 Wind Sensor, DST-800PSF Digital Depth/Speed/Temp sensor, and two FI70 Digital Data Displays. The package includes the IF-NMEAFI Analog to NMEA2000 data converter as well as the FI5002 Junction Box for a simple installation and full compatibility with other navigation equipment. Whether you use these instruments by themselves or as a part of your NavNet system, the FI70DSW will add both function and beauty to your helm.